What happens during a day on African safari? Your day on African safari will start with an early moring start and your first scheduled game drive. If you were lucky you will spot the Big five African animals already. Some safari operators have libraries with reference books about the bush and wildlife that you can use during this time. Noon is siesta time in the bush when all living things head for cover. You can follow their example and spend the middle of the day relaxing at the camp pool id one is available. Most wildlife takes it easy during the heat of the day and only get active later when the day cools down again in the afternoon. Lions don’t have any specific habitat preference so you could expect to see them anywhere during your bush trip. 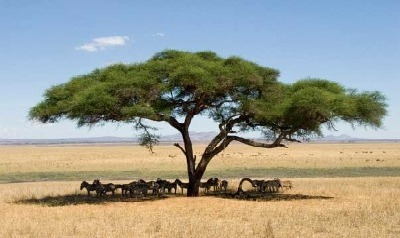 When you spot African lions during your day on an African safari, it is likely that they will be resting in some shade. They may be enjoying good fellowship with lots of head rubbing and purring. This peaceful harmony changes totally when they feed on a kill. The good fellowship then quickly degenerates into squabbling over the sharing of the kill. The rule when approaching potentially dangerous game is to keep safety in mind at all times and to approach only as closely as you would if you were unarmed. If you want to experience a totally different perspective of an African Safari you should consider a walking safari with a guide. A bush walk gives you the opportunity to view wildlife at ground level and to appreciate other aspects of he bush experience. 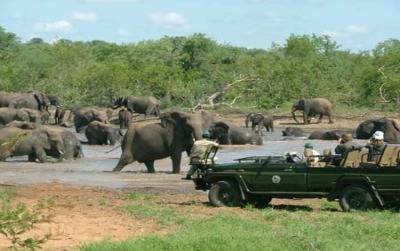 You will likely be offered some light snacks and refreshments, before you depart for your afternoon game drive, which normally ends around sunset. The afternoon game drive will generally be shorter than your morning game drive. At this time the heat of the day is slowly cooling down and the animal world is getting back to life. No African animal has a more distinctive coat than the zebra. You can look for them on grasslands, plains and open wooded areas, which are close to water. 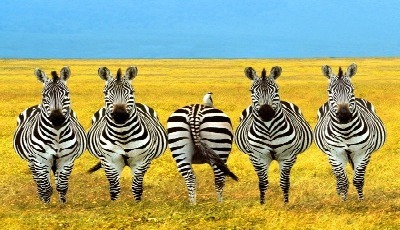 At first glance zebras in a herd might all look alike but each animals stripes are however as unique as human fingerprints—no two are exactly alike. It is also the time of day that a lot of animals will head for a last drink and the waterholes will start to get crowded. Although leopards are well represented in the Southern Africa bushveld, their elusive movements and mainly nocturnal habits make them difficult to spot on an African safari. This makes them a prize encounter on all game drives. During a day trip the best possible chance of a sighting will be when they relax in a tree. This is likely to be a tree in a riverine forest area, which is their favorite habitat. At sunset on an African safari day your guide is likely to find a scenic wildlife viewing spot where you can enjoy a sundowner in the bush. Now you can prepare yourself for the evening session of an African safari day.